Recently moved from America, due to her father finding work at a prestigious English school, Michelle feels rather out of place in her new castle town home. When she first starts drawing a handsome guy in historical attire, she thinks nothing of it. 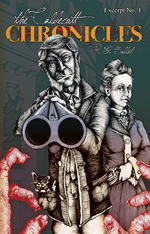 But then a strange encounter at the castle makes her question whether the man in her drawings is truly a figment of her imagination – and draws her into the long-ago events that set into place the social structure still governing the modern day town. Marie Lamba has proven herself to be a very proficient author of realistic young adult fiction, with her first novel, What I Meant… being published by Random House in 2007 and its sequel, Over My Head being much enjoyed by me when I reviewed it for my blog last year. 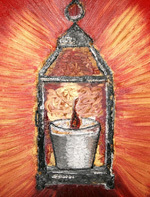 I was intrigued, therefore, to discover that her next offering would be a paranormal offerings. There are no vampires or werewolves here, however. 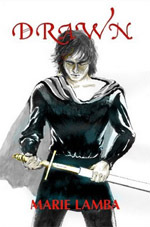 Instead, Drawn explores a connection across the centuries with a romantic interest who appears in Michelle’s life like a ghost from the distant past. Michelle is a likeable protagonist, whom readers should find it very easy to identify with. Her isolation in her new home makes her immediately sympathetic and her determination to ensure Christopher’s safety is admirable. More importantly, she doesn’t fall into that all-too-common paranormal trap of losing herself in order to be with her love interest. She is willing to make sacrifices for Christopher, but will not stand for too many of his dated ideas about women. Indeed, the best thing about Christopher, in my opinion, was the fact that he isn’t just a modern character in historical dress. He does not react to Michelle like someone from her own era and nor is his behaviour modern – especially when it comes to modesty! 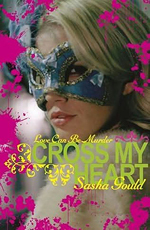 Lamba prevents him from ever seeming boorish, however, even at his most unrefined, which makes Michelle’s feelings for him believable – and will probably ensure he earns a lot of reader fans as well. For me, however, the most fascinating character was William, son of the town’s most influential man. His depiction had so many different facets to it and his nature was so complex that I couldn’t help but be intrigued by him. He’s never entirely likeable – but that’s rather the point! In contrast, I wished that we had seen a little more of Constance. I found her character very interesting and a good foil to William and I would have liked to see how things worked out for her. With a little help from Back To The Future, Drawn looks at the troubles associated with time travel to the past, in terms of changing the present, but also deals with the difficulties of a a romance where the two lovers’ worlds and lives are not just separated by states or oceans, but rather by time itself. While I thought that the novel’s ending was possibly a little too perfect (or perhaps that should just be enormously lucky! ), I enjoyed the way that Lamba presented Michelle’s struggle to balance family ties and romantic love and thought her conclusions were very appropriate. A clever and enjoyable paranormal romance with a love affair that fans of the genre are sure to swoon over. 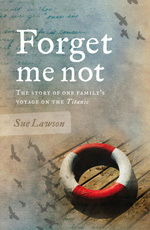 This is an excellent book and a powerful – if not at all times enjoyable – read. 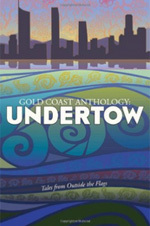 There is a poetic feel to the language and a tangibility to the landscapes in which the novel is set. While not getting caught up in description, Womersley still manages to paint a vivid scene inside the reader’s head. The storyline is fairly simple, yet placed against the backdrop of the Great War and the Spanish flu epidemic, its tragedy is emphasised. A slight hint of magic realism adds to the book’s overall feel of otherworldliness. I was lucky enough to win a copy of Bereft through Goodreads FirstReads, and I think it’s the perfect example of why FirstReads is such a fantastic thing to be able to be a part of. Of my own accord, I possibly would never have picked this book up, because I don’t read a lot of modern non-genre fiction. 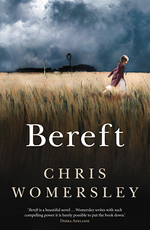 But I really would have missed out, if that were the case, because Bereft is a wonderful book that was an absolute pleasure to read. Warning: There is one scene involving an animal death that I found upsetting. On the whole, I found The Waste Land to be a very enjoyable read. 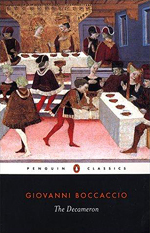 Acland presents himself as being well-versed in the era during which the novel is set. It’s not my own period of historical expertise, but his universe felt authentic and meshed with my knowledge of earlier and later times. A bibliography is always a wonderful thing to see at the end of an historical novel, both because it provides a jumping-off point for further reading and because it suggests that a good level of research went into ensuring a good level of historical accuracy. That said, one doesn’t need to be a history buff to appreciate this book. 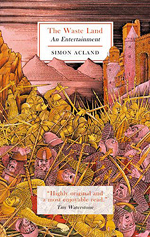 Acland’s writing style is quite formal throughout the novel, but accessible nonetheless, and the setting of the first crusade is one that lends itself to sword-wielding adventure. His protagonist is both sympathetic and likeable, and Acland surrounds him with a cast of well-drawn characters. The villains are suitably villainous and the heroes are pleasantly fallible. The plot was not what I first expected it to be, but at no point did I find myself bored with the story and the ending left me mulling over the books entirety for quite some time. My key difficulty with The Waste Land was the stylistic choice to place a story within a story. The segments set in the modern era are witty caricatures of types anyone with a knowledge of academia will recognise but, to me, they came to feel like unwelcome intrusions upon the story that I actually cared about. I understand that this format is what sets the novel aside from other historical works, but feel that the main story holds its own without the need to jolt the reader out of the action at the end of every chapter. Despite this, however, I think that the book is a very good addition to the historical genre and would be most interested to see where Hugh de Verdon ends up in the sequel.